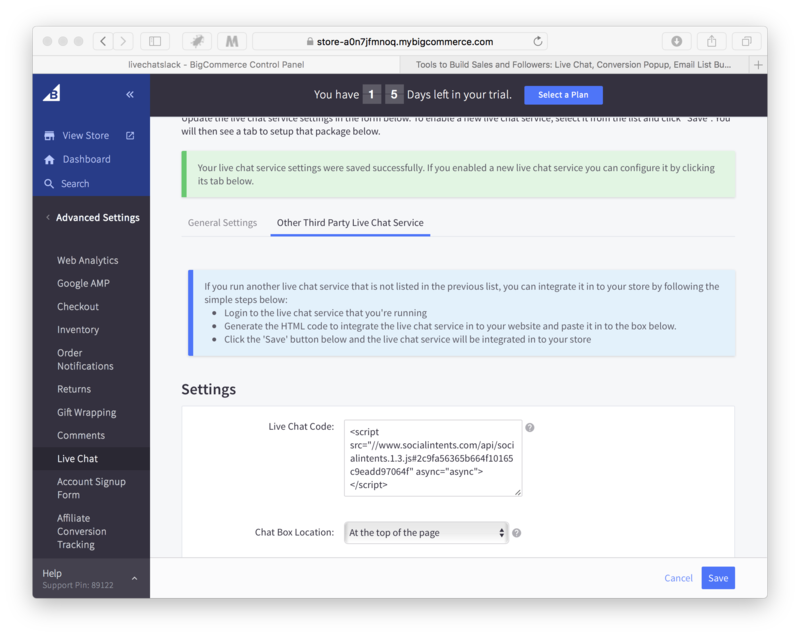 The first step for adding live chat to your Bigcommerce site is to add the Live Chat by Social Intents app using the Single Click Install. We don’t require any other registration or separate login. After adding the app, you’ll see a Live Chat icon in your left­hand navigation and a number of navigation options. Next, follow the below to enable the live chat in your store. 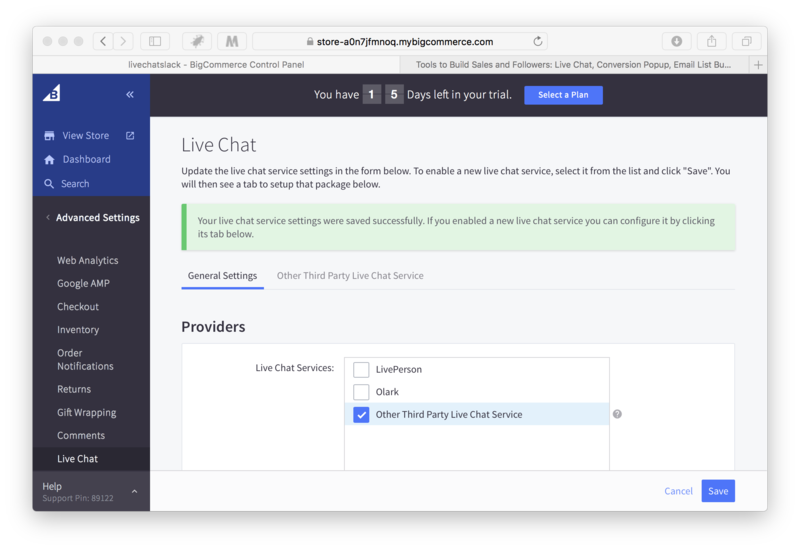 Include Your Code Snippet in your Bigcommerce Live Chat settings. If you click on Advanced Settings, then Live Chat, you'll see options for live chat settings. Copy your code snippet into the Live Chat Code text area. Finally select Chat Box Location: At the top of the page. That’s it! Your Live Chat is now enabled on your site! In order to Slack right from Slack, you'll need to add your Slack integration to Social Intents. You can chat with your website visitors right from your Live Chat console. The first time you click on Live Chat in your browser, you’ll be prompted with whether to accept Notifications. Make sure you answer yes so that you can receive live chat notifications right on your desktop as popup notifications. Desktop notifications are supported on Chrome, Firefox, and Safari. You will receive inbound notifications of new chats right in your live chat console as long as you’re logged into Social Intents in your browser. It can be hidden, in another tab, or minimized and you’ll still get the notifications. A good practice is to login once in the morning and keep the tab open. You’ll still see and hear inbound chat requests even if that window is not active. After you click on a row, a new tab will open with the chat you selected. Just type text into the message area and hit Enter to accept the chat and start a conversation with your website visitor. 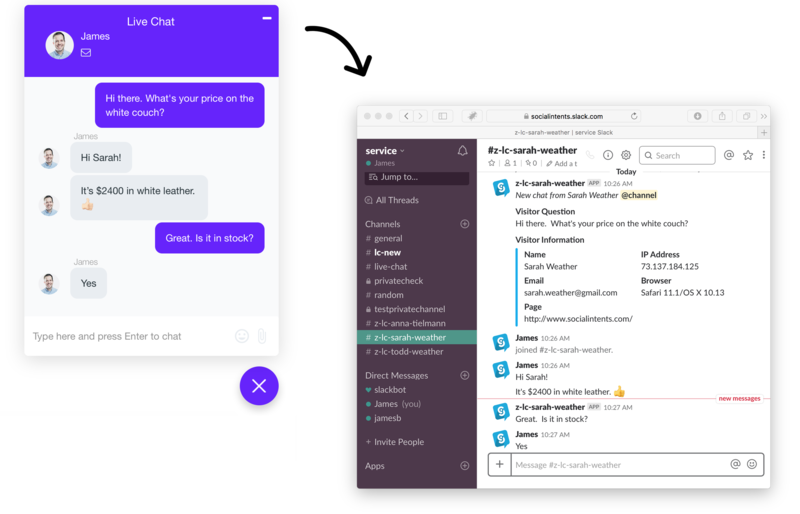 We support a variety of chat notifications including HTML5 desktop notifications, email notifications, and mobile push notifications using the pushover.net mobile app. The first time you login from Safari, Firefox, or Chrome, you will be asked if you’d like to show notifications from www.socialintents.com. Select “Show for this session”. This allows us to use the browsers desktop notifications to push messages to you. Even when your browser is minimized, as long as you are logged into our site, you will receive the incoming notifications as a desktop notification. Simply click the inbound notification to open the chat. You can also enable email notifications under your Agent Settings notifications area. We will send an email to you every time there is an inbound chat request. If you’re often away from your computer, we have a setting under your Agent settings called “Stay Available Even When Not Logged In”. Be sure to enable this option if you want your Live Chat to stay online even when you’re not logged into our website. That way, you can receive an email of any incoming requests. You just click on the Open Chat button in the email to go right to that chat. You can even do this from your mobile phone! The online and offline text fields are the text that is displayed on the chat tab. Modify these to grab the visitors attention or for your specific needs. When changing either of these items, you have to re-include the generated code into your Bigcommerce shop. You can change the tab color to any hex color to match your branding. Please note that after changing the tab color, you’ll also have to re-include the code snippet into your html page. Just a note, you can change the other settings on the fly and not have to re-generate the code snippet. You can customize every single field name, text, and message that is displayed in your live chat. This level of customization is what sets our live chat apart. Customize the text for your brand, or translate it for your language. We make it easy to set up your entire team as agents. Each agent has their own info, display name, and credentials to login to our site and answer chats. As an Administrator, you can monitor all active chats and even help agents answer questions. Display Name: The display name is what is show the website visitor when chatting. Job Title: The job title is the subtext that displays under and agent name to the visitor when a chat begins. Use this for an agent role or position (or whatever other creative text you can think of). Current Status: Whether the agent is online or offline. You can force someone online or offline here by changing this field. Notifications: Use the Notifications area of the Agent Details to configure how the agents will be notified of new chat request, either Email or Native Mobile Push. Stay Available Even When Not Logged In: Enable this option if you always want your chat tab online and you typically answer chats from Email or Push. This will have the effect of keeping the Chat Tab online as long as this option is chosen. You have complete control over when your chat tab is online or offline. These are controlled by your Agent Availability in the Live Chat Console. When you open the Dashboard, you are automatically made Available by default. With multiple agents, if at least one of you are Available, then the chat widget will be online. If you want to force the chat widget offline, change your status to Unavailable. For multiple agents, you can click on the Agents tab, and select each individual agent and force them offline. We store all missed and offline messages right in our app so you never miss them. Use the History link to search on and view all chat transcripts, missed, and offline chats. We have a mobile optimized chat interface that allows you to chat with visitors while you’re on the go. You can click on an email notification or on a push notification to open the chat on your mobile phone and start a conversation with the visitor. See the section above titled “Mobile Push Notifications with Pushover.net” for details on configuring your mobile phone with native push notifications. Shortcuts are a great way to set up default message responses to questions that your visitors typically ask. Configure these in the Shortcuts section and have quick access to all shortcuts right in the top right of your Agent Chat window as a shortcut list. Use shortcuts to save time and increase customer satisfaction. Click on the Shortcuts icon in the top-right of the chat to open your available shortcuts. Then select the shortcut and hit Enter to send the message. With our Language Customization features, we support full control over the language displayed to the visitor in the live chat. You can modify every field for your native language and for your brand. You have complete control and flexibility in what the visitor sees. Make sure to login to your Live Chat every morning to change your chat from Offline to Online. Set up notifications if you’re not always at your computer, and try to respond to customer requests in under a minute if possible. If you happen to miss a chat, always respond to any inquiries from your History in Live Chat. You’ll see chats labeled as missed or offline for the ones you didn’t get to.